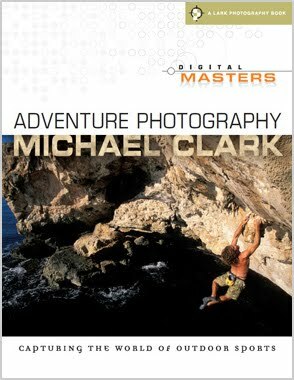 I just got word that my book Digital Masters: Adventure Photography is now available and is shipping from Amazon.com. This is a major surprise to me as the publisher told me there was no way they could get it out before January 1st. I guess they worked something out - haven't heard back from them just yet with the holidays but Amazon has the book in stock and will be shipping them today to folks that have pre-ordered the book. In fact, I heard about all of this from one of my newsletter subscribers who emailed me to let me know that he got an email from Amazon, who said the book would ship today (the day after Thanksgiving) and arrive early next week. So for those of you that pre-ordered the book, it is on the way. This beautifully produced guide by Michael Clark is the newest entry in the Digital Masters series, as well as the first book on a fast-growing photographic genre: shooting today's popular extreme outdoor sports, from mountain biking and ice climbing to surfing, kayaking, and more. Clark is one of the world’s most respected adventure photographers, and he offers sage advice—gained from years of hard-earned experience—on equipment, techniques, and the specific skills required to get in on the action. Learn to capture fast-moving subjects and deal with harsh conditions and horrible weather—even when you’re hanging from ropes and riggings in a squall. Of special interest is the Portraiture and Lifestyle chapter, which covers increasingly in-demand techniques. If you haven't gotten ordered a copy of the book yet, Amazon has them in stock and you can find it here. 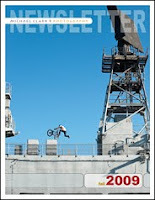 The Fall 2009 issue of the Michael Clark Photography Newsletter is now available for download. If you'd like to sign up for the Newsletter just drop me an email and I'll add you to the mailing list. This issue includes an editorial with updates on recent assignments and upcoming trips, an equipment review of the 12 MP Nikon D3 vs. a 39 MP Hasselblad H3D, a special portfolio section detailing a recent assignment with Red Bull in San Diego, California, a perspective article on Connecting with your Audience and much more. 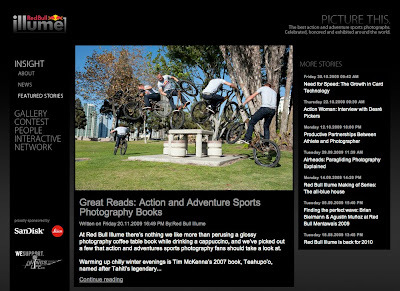 Red Bull posted a feature article on the Red Bull Illume website which promotes a few adventure photography books including my book, Digital Masters: Adventure Photography, which is due out January 1st, 2010. In addition to promoting the book the website also features one of my images of Danny MacAskill shot for Red Bull in early October. 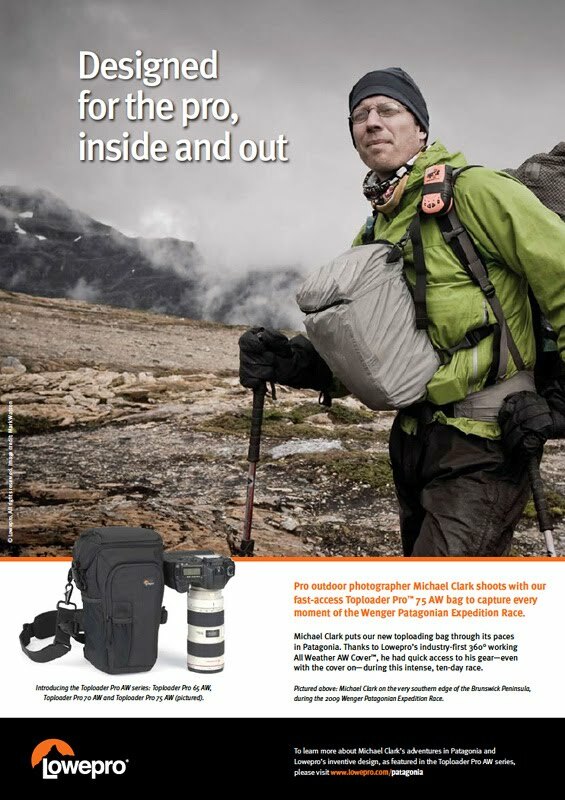 Some of you might have seen it already, but for those of you that haven't, the camera bag manufacturer Lowepro is running a full-page ad (above) in several photography magazines all over the world right now. My thanks to Lowepro for promoting me and using an image shot by Mark Watson. The image was shot while covering the 2009 Wenger Patagonian Expedition Race. Mark, Lydia McDonald (writer) and myself hiked into the last trekking section with a group of racers and we had a stellar adventure ourselves in one of the most remote and uncharted areas on the planet at the very southern tip of South America. If you'd like to see more images from that adventure please check out my images from the race. Also, for the full story, you can download a PDF article that details our adventures from Lowepro's website. I just got back from teaching a stellar lighting workshop in Philadelphia with David Tejada for the Mentor Series Workshops, sponsored by Nikon. While it was only a three day workshop most everyone felt like they had been there a week or more by the second day. We stuffed in an incredible amount of information on lighting and even digital workflow. And I have to say the participants images were absolutely incredible. I was very impressed by the caliber of photography. Above is an image I snapped at the very end of the day with one of the participants cameras just to give you an idea of what we were working on. 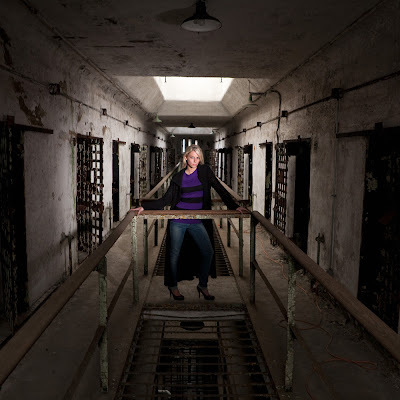 This image of model Lisa Versagli, was shot at the Eastern State Penitentiary in Philadelphia, where Al Capone was once incarcerated. The prison is a ruin that is being preserved. It was originally built in 1827 and opened in 1829. Hence, it is one of the oldest prisons in the United States. It was also used as a location for the film 12 Monkeys and more recently, Law Abiding Citizen. My thanks to Michelle Cast and PopPhoto for bringing me out. I look forward to teaching with the Mentor Series again here soon at some point.